Diamonds Are Forever was directed by Guy Hamilton and features the legendary Sean Connery as James Bond for the very last time. The seventh spy film in the popular series sees Bond impersonating a diamond smuggler to uncover a plot to destroy a city. Will he be able to keep one step ahead of his nemesis and save the day? Based on Ian Fleming’s novel of the same name, this thrilling film is about Bond’s battle with his old nemesis, Ernst Stavro Blofeld, after discovering he isn’t just a diamond smuggler but is using the diamonds to build a giant laser to destroy Washington DC. Starring alongside Sean Connery is Jill St. John (The Lost World, Tony Rome) as Tiffany Casethe, Charles Gray (The Devil Rides, You Only Live Twice) as Ernst Stavro Blofeld and Lana Wood (Captain America) as Plenty O’Toole. The Port of Dover was used for the scene where Bond swaps identities with Diamond smuggler Peter Franks (Joe Robinson) and makes his escape to France. The Port of Dover has also been used for filming by Sherlock Holmes: Game of Shadows (2011), Albert’s Memorial (2010) and Missing (2009). 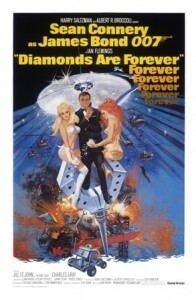 Diamonds Are Forever can be purchased on DVD. This entry was posted in Filmed in Kent and tagged Diamonds Are Forever film locations, feature film, Guy Hamilton, Sean Connery, The Port of Dover. Bookmark the permalink.